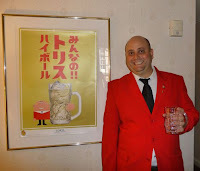 As I mentioned previously, my favorite thing at Tales of the Cocktail this year was the Nonstop to Tokyo. It was by luck, and the kindness of my friend Nathan Luchansky, that I was even able to attend - the event was completely sold out at least two months ahead of time and Nathan gave me a ticket. Here are some pictures from the event, as well as some details to give a sense of why it was great. Starting out, we headed into a suite and were given a boarding pass for our trip to Tokyo. 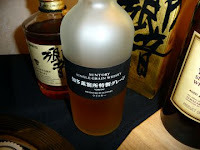 The event was sponsored by Suntory , and featured a variety of their whiskys (they don't use the "e") as well as a few other spirits that they handle in Japan. 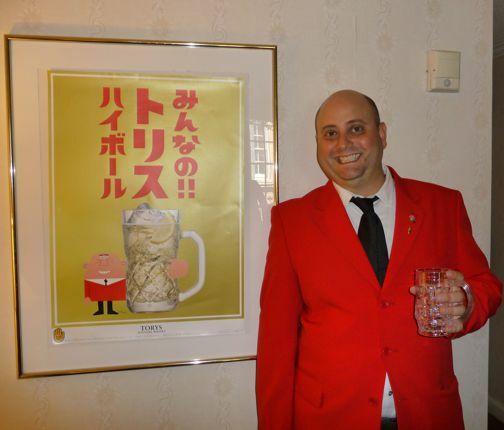 My friend Neyah White, now an ambassador for Suntory, but formerly head barkeep of one of my favorite places in San Francisco, was there as our tour guide. On entry, we were given access to two side rooms - one where a cocktail with Hibiki 12 was being served, and one where we could sample a variety of Japanese whiskys and play a little putt-putt golf. One of the spirits we were invited to taste was called "Chita." Not available in the US on it's own, it is used as part of the blend in the Hibiki whiskey. It's a really interesting, delicious spirit - made from 100% Japan-grown corn, and aged in used bourbon barrels. It tastes like a fine aged rum and was quite sippable. After while, we were invited into the main room of the suite, where there was small bar with seven or eight seats. Hidetsugu Ueno from Bar High Five in Tokyo greeted us, and presented us with a menu of cocktail options. 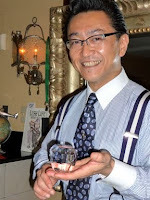 And then, essentially, he made us cocktails and told us a bit about cocktail culture and cocktail making in Japan. One of the cocktails was served at room temperature in a tulip glass, with undiluted honey in the bottom, so that the drinker could adjust sweetness to taste by swirling the glass. The techniques he used, and the fluidity of his motions, were beautiful to watch. 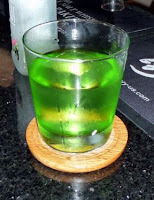 Both Midori and Southern Comfort are very popular in Japan. 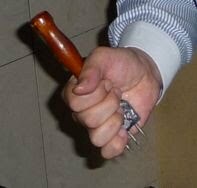 It is common to use knives completely up - the knife he used on the ice block was used for other things in the past, but the blade has shrunk over time and now it is only good for carving ice. 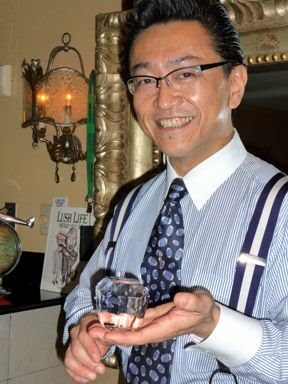 Thiswas a truly unique experience, and a wonderful introduction to the cocktail culture in Japan. And, I got to try a couple of new whiskys and get a couple of good ideas for cocktails, too. Thanks again to Nathan for finding me and giving me the ticket!